Paradise Valley Cottage is your comfortable home away from home set amongst giant willows and pine trees with a view of the Rocky Mountains. 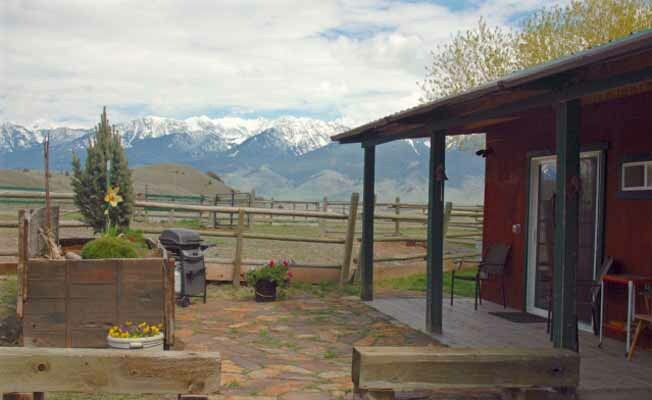 The cottage is a stand alone building on our property, with a private entrance, and centrally located between Livingston and Yellowstone National Park with easy access to all that Paradise Valley has to offer. Step onto the wood deck and flagstone patio to enjoy the magnificent views and barbecue your favorite meal. Walk along Eight Mile Creek to our private pond and watch the trout jump or stop on the bridge to enjoy the music of the water flowing while gazing up at Emigrant Peak. Five miles from the cottage is Chico Hot Springs. After a day of hiking or skiing this is the place to be to sooth your tired muscles and relax. Here you can catch a meal at the grill or make reservations for a more elegant dinner in the dining room. Later, you can take in a live band and dance the night away. On the way to Chico Hot Springs there is a general store with everything you can imagine and across the street is a post office, bank, lunchenette, bakery and the Old Saloon where you can enjoy a fantastic breakfast, burger or your favorite beverage. The biggest attraction is just 35 miles south - Yellowstone National Park. Besides the famous Old Faithful Geyser, you will see wildlife - bison, elk, bear, big horn sheep, and if you're really lucky, wolf. The Park has so many wonderful sights that one day is never enough. If you are able, hike some of the back trails to really experience the peaceful beauty and in the winter, take a snow coach tour, snowmobile, or cross-country ski to enjoy the silence and pristine beauty. For all the fishermen out there, Yellowstone River is easily accessed by our private site, one-half mile from the cottage. Set your drift boat in the river or wade in to catch rainbow and brown trout. Whether you are fly fishing or bait fishing, Yellowstone River will not disappoint. In the summer, if you're look for a boating experience or want to sunbath at the beach of a lake, Daily Lake is 15 minutes away and swimming, sailing, fishing and windsurfing are some of the popular activities found on this lake. In the town of Livingston, among all the necessities (grocery store, pharmacies) you will find museums, art galleries, a farmer's market on Wednesdays throughout the summer, restaurants and boutique shops. There is also an 18-hole golf course and Sacajawea Park which hosts the annual music summer fest in July. Wintertime brings to Livingston live plays at the Blue Slipper and Firehouse, seasonal events such as the Christmas Stroll, bazaar and New Years Dance at the Depot.